Everyone Needs a Good Bucket! Do you have a tall employee that bends over to use our PVA mops? The optional mop extension handle is the perfect answer! It can be used with all three sizes of The Super PVA mops. Our existing mop handle extends from 39" to 52". The optional mop extension handle extends from 50" to 73". Simply remove your existing handle and replace with the optional mop extension handle. It is also handy for walls, ceilings, and windows. 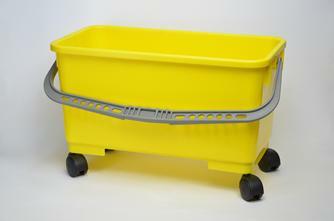 Need a more robust handle for mopping floors? Order the optional mop extension handle. It is more durable since most of the two shafts are not extended when mopping floors. 335-0018 - Optional Mop Extension Handle - fits The Super 7", 11", and 16" mops - yellow color - $9.95 each - Important Notice: This product is not available for shipment to countries other than Canada and the United States due to size restrictions of foreign postal authorities!